Make sure you make it all the way to the end of the post for a special announcement! Okay, so if you know me and my family and live anywhere near us you would know that we are known as the Griswolds of our neighborhood, because every year we have the brightest house in the ‘hood. 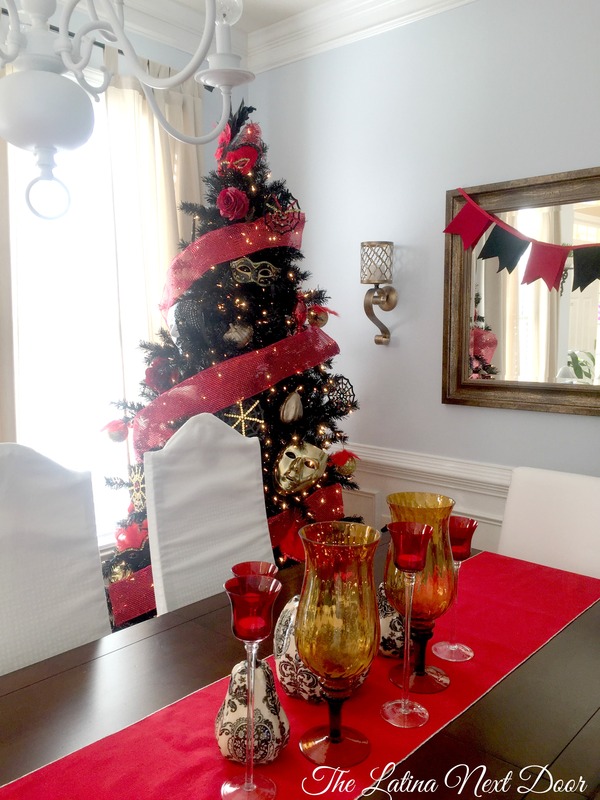 We love Christmas and Christmas trees and lights and ornaments and…. well, you get the idea. So when Treetopia reached out with the opportunity for me create my very own Halloween tree, I was overjoyed! I mean, the sooner I can get a tree up and decorated in my home, the better! Amiriiiight??? I quickly fell in love with the Obsidian Black Christmas Tree. Gorgeous! I love it because it is not like most black trees you find in stores. It has the perfect sheen making it such an elegant and shimmery tree. It was easy to assemble and incredibly full. Plus, it is pre-lit so setting it up and plugging it in only took a matter of minutes. 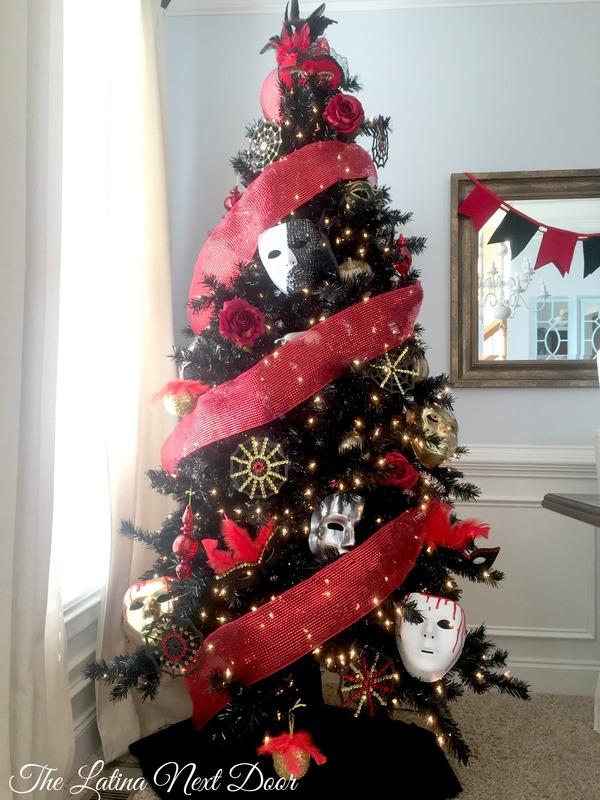 I’ll be honest, I have never done a Halloween Tree before, but the first idea that came to mind was to create a Phantom of the Opera/Masquerade Inspired Halloween Tree. And frankly the best place for it was our dining room! So, the first items I needed were masks and I was able to find these gold, silver and white masks from Party City. Then, of course, I headed to Hobby Lobby to find some inspiration and craft supplies. 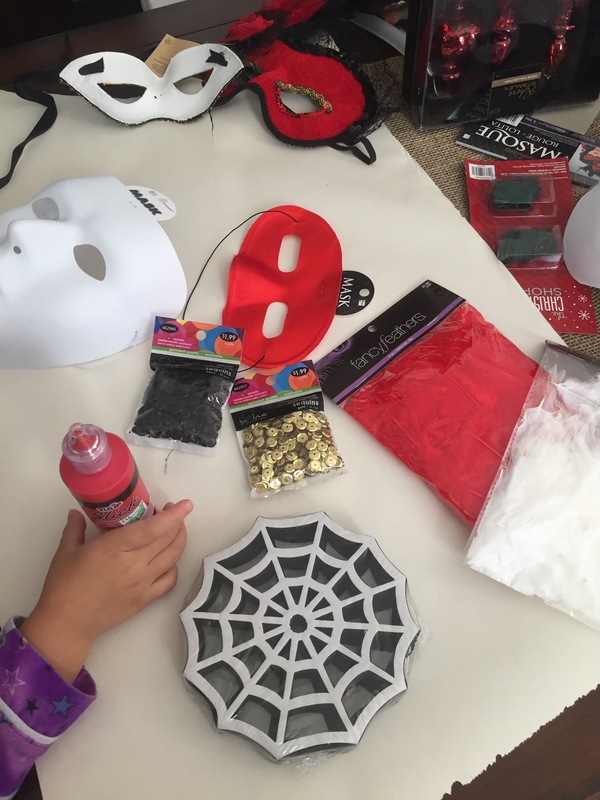 I got feathers, roses, cute foam spiderwebs, dimensional fabric paint, sequins and ribbon. Then I got to work on my masterpiece. 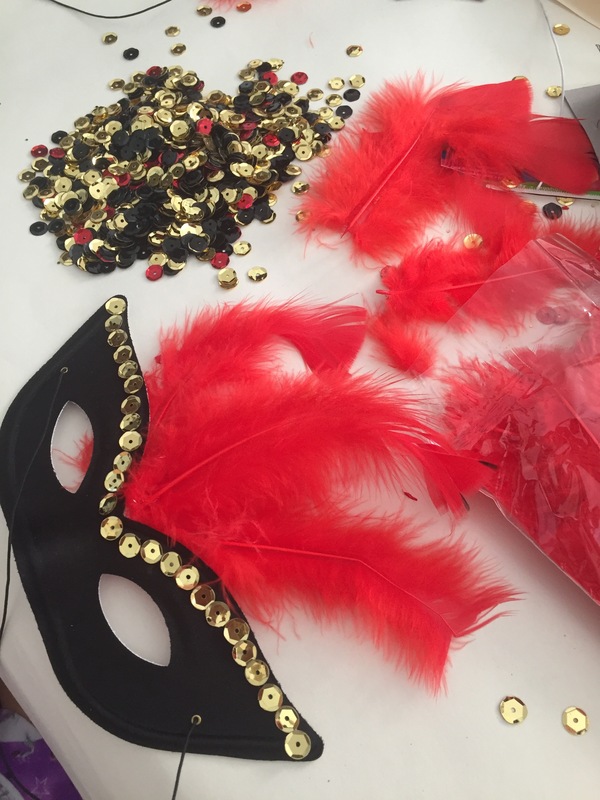 Together we embellished the spiderwebs and masks with sequins to give them some sparkle and dimension. 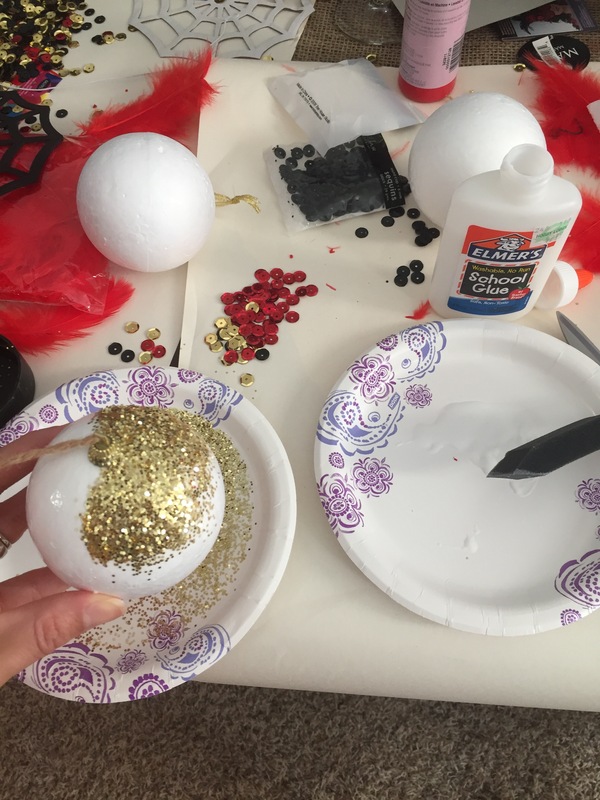 I had these foam ball shaped ornaments I bought on clearance last year and I applied glitter and feathers to them to go with the theme. I’m such a messy crafter, I know! Then, I really wanted to do something a little more eery and decorate some of the masks with blood. 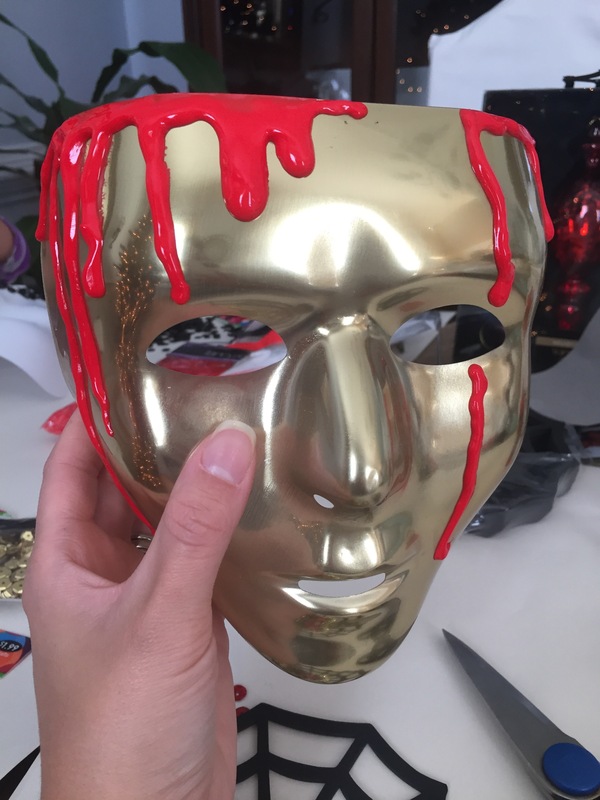 I used dimensional fabric paint and began to apply the paint on the top part of the masks and then began to run the paint down (as if the blood was dripping down them). They came out exactly as I had pictured them! And then it was time to put it all together and everything just coordinated wonderfully. Here is a close-up of one of the masks my daughter helped me decorate. With the extra details we added to the white masks, they actually ended up looking like they were porcelain. The dark red roses I added reminded me of the love story behind the Phantom of the Opera. 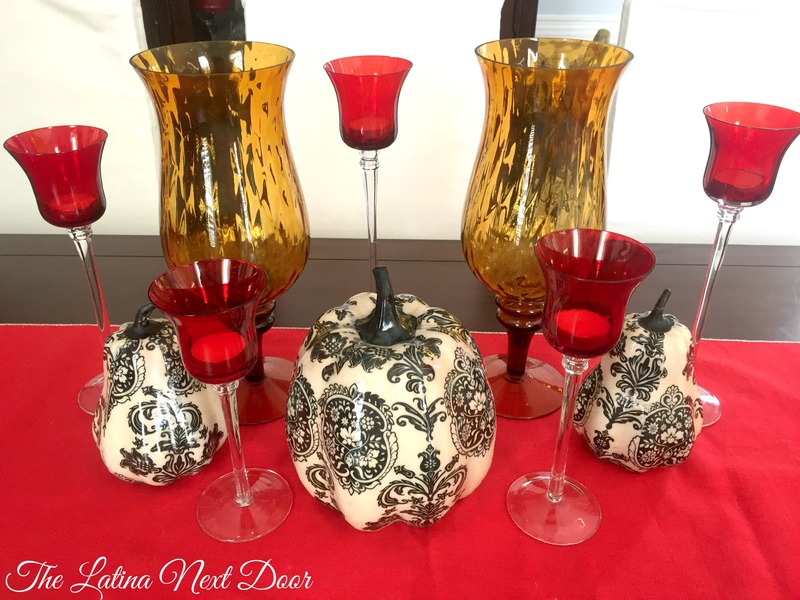 I even used some of the pumpkins I transformed for my DIY Fall Centerpiece. The gold pumpkins looked perfect with the color scheme. I included large red glass ornaments as they reminded me of a combination of grand chandeliers and red velvet walls you would find in an old Opera house. 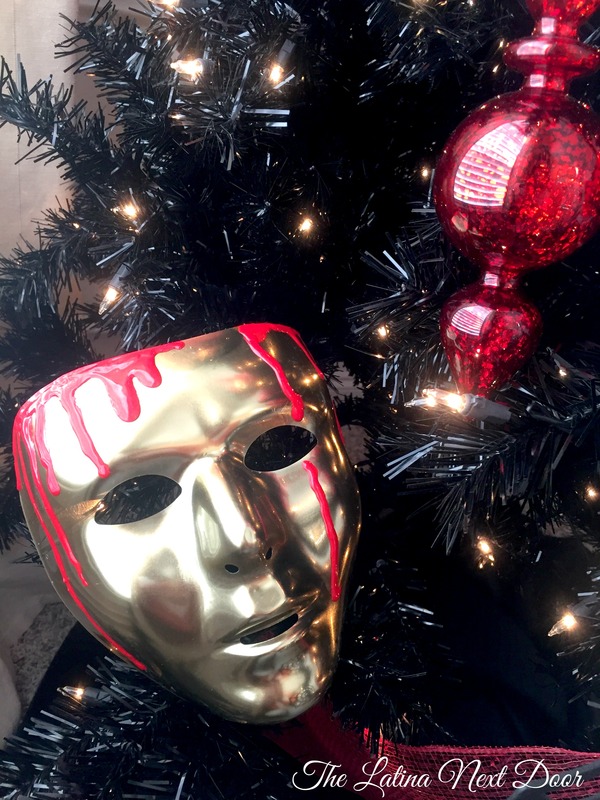 The red and gold decorations really popped on the black tree. And finally, I added a tall feminine mask with tall feathers for the topper. But I just couldn’t stop there! 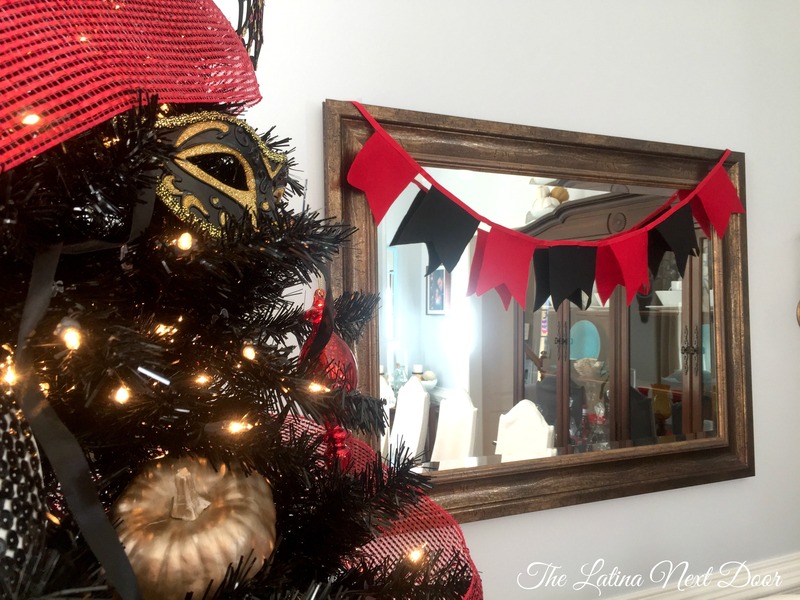 Since I wanted to tie my dining room together with the tree, I created a simple red and black flag swag from a couple of felt sheets and red ribbon to go over my dining room mirror. I found some candle holders and pumpkins I had saved from previous years (thank goodness, I’m a hoarder!) and created a simple centerpiece for the table. The runner is actually a Christmas runner, but I turned it upside down and it worked out perfectly. I just love how everything turned out. 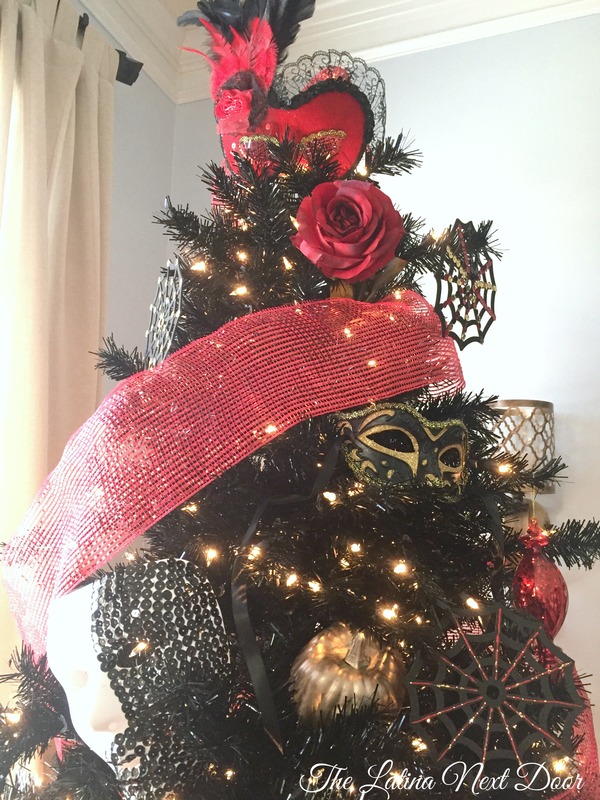 I hope I inspired you to do a little something different with your trees this holiday season. 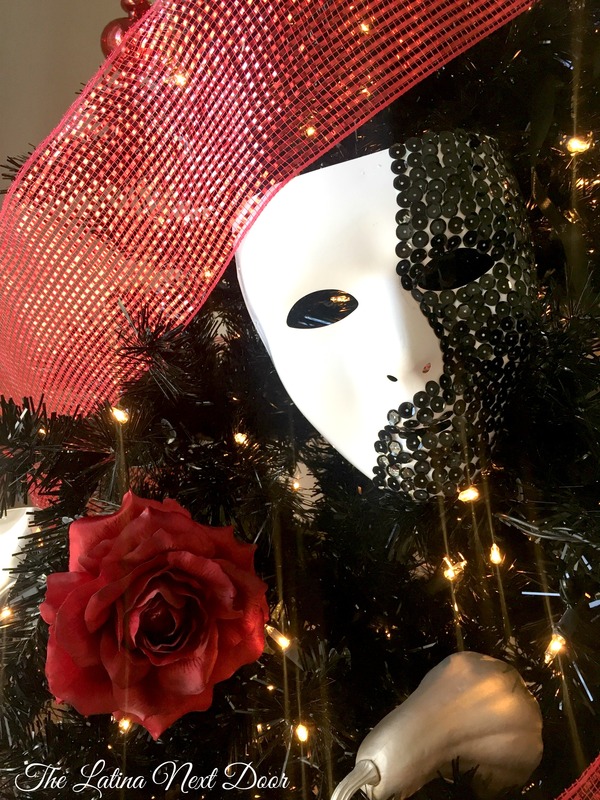 And if you are looking for even more inspiration, head on over to the other talented bloggers who created their own Halloween trees for this fun Blog Hop, then check out the Treetopia Blog for even more ideas! 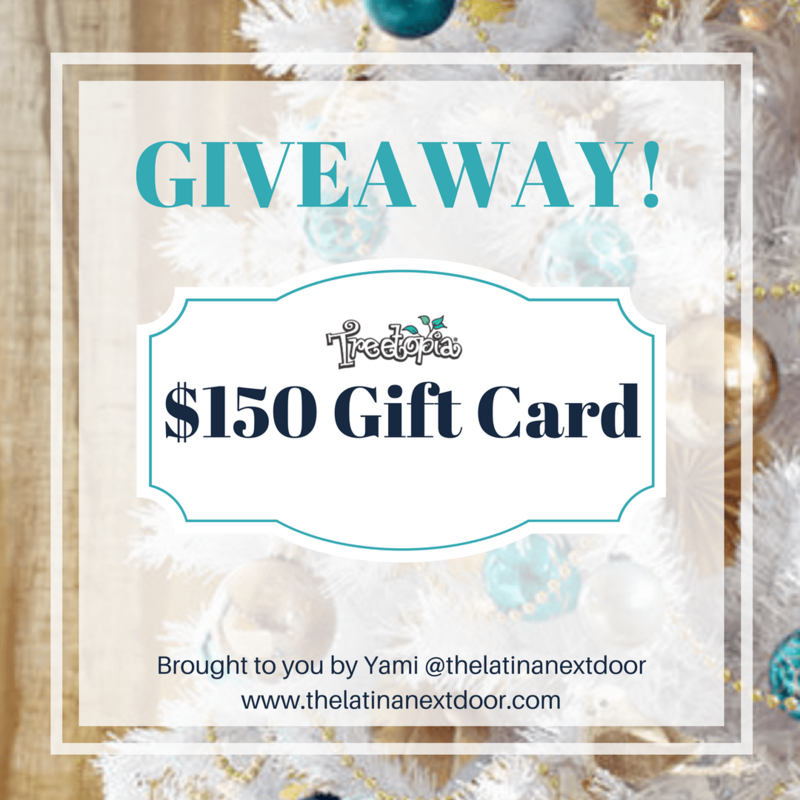 Treetopia and I have come together to give away a $150 GIFT CARD so that you too can have an amazing tree as well! First, make sure you are following me on Instagram. Then be on the lookout for my post (below) first thing tomorrow morning with all the instructions on what to do and when the winner will be announced! Need a little reminder? No problem! 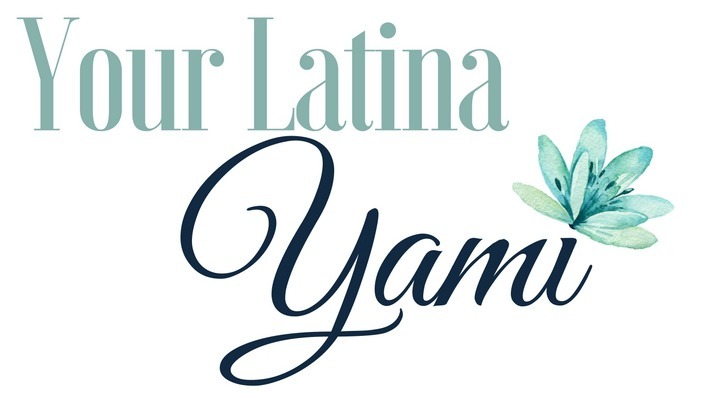 Just subscribe to my blog and I’ll send you a message so you don’t forget! Which tree will you get if you win? I’ve never seen a black tree and yours turned out amazing! Great job! Thank you! I would have never gotten a black tree before this. Now, I am excited to see what I will do with it next year. How inventive. Such a clever ides. Not only is this great for Halloween, but the kiddos get to decorate two trees this year! Great ideas! 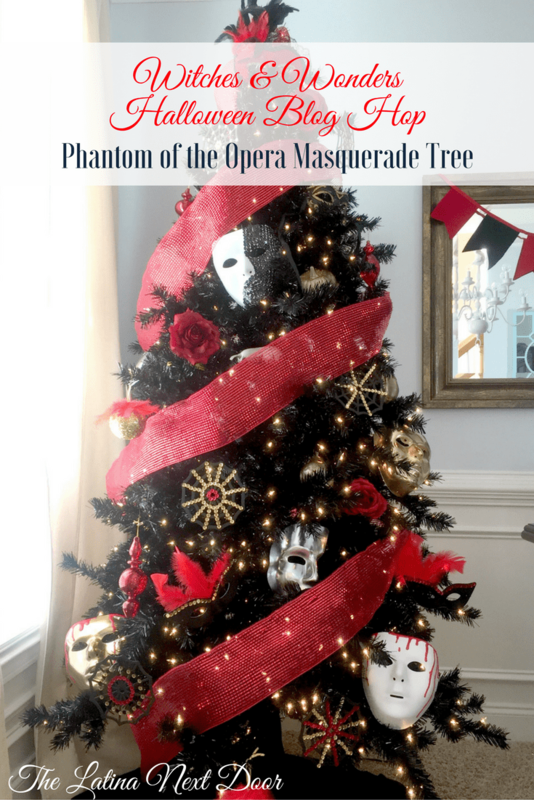 Love the Phantom of the Opera tree! Thank you! I am so glad I went with that theme. I love a good theme! This is beautiful with the right about of spooky Halloween spirit. What a great idea! Thank you Brittany! It was so much fun to decorate. I cannot wait to see what I come up with next year! I can’t wait either! 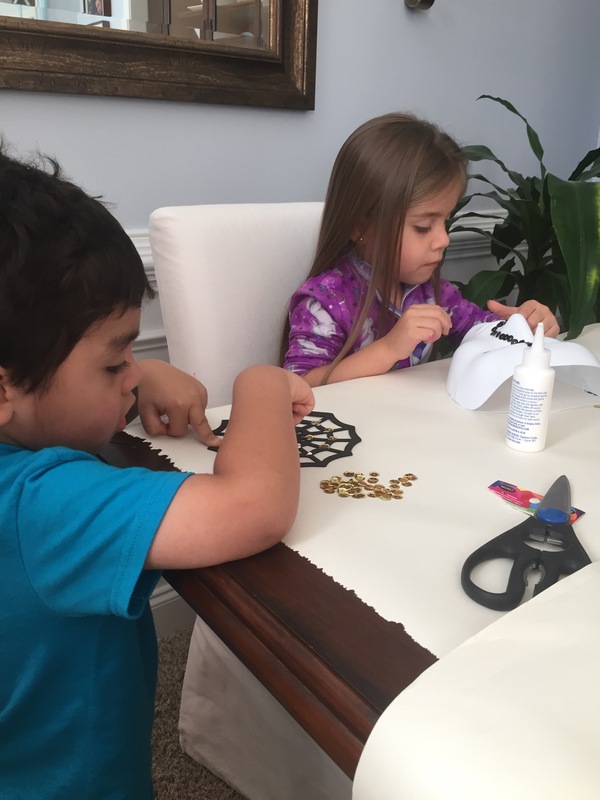 I loved it and I loved that you got the kids in on the crafting! I know! That’s exactly what I was thinking! My neighbors probably think I’m crazy (cause they can’t tells if it’s a Halloween tree from the outside). The sooner I can celebrate the holidays, the better. Now I have an excuse to get a black christmas tree. Love this idea! Thank you! I have a new appreciation for black trees! Who would have thought!